Kopila has written here about learning about colour theory using Tracy Holmes’ Breakthrough Colour Cards but I wanted to write here from my perspective. You all know I travel twice a year to Nepal and we go a bit mad trying to fit as much into each visit as we can. There are always new ladies to teach, new designs to learn, procedural drift to undrift, orders to fill. We all adopt a learn what we can and move on from our mistakes approach and generally have an exhausting ball. Always in my mind is the idea that if I drop dead tomorrow, I want the ladies of Samunnat to know how to do things themselves. Teaching always has a focus of empowering the ladies to do as much as possible independently of me. 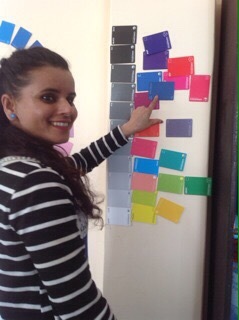 Helping them to understand about colour and colour matching and selection and the mysteries of what colours westerners like has been a part of that that was always just a bit too big and overwhelming to do! My attempts to explain why the red seed beads they had selected to go with red and white polymer beads they had made didn’t match even though both were red was hard! There was no real sense of a pink based red vs an orange based red. It was just apple red, or flower red, or laliguras red. I needed a tool. I remember sitting with Kopila at Tracy Holmes’ presentation at Eurosynergy on Malta feeling like there was something wonderful that was just out of my reach, somehow just beyond me. Flash forward nearly two years and I was packing a box of Breakthrough colour cards, with a vibratory tumbler, into my bag. I was so nervous about using those cards. I had only had a small chance to look at them, meditatively blu-tacking them to the wall of my teaching studio. Again, there was this sense of half getting something, sort of flitting around the edges. translate them ( a challenge given my limited Nepali!) The secret was the stepping!! At first our stepping was tentative, nervous, hesitant, but the more we threw around those cards ( who knew, learning didn’t happen while they looked so neat in the box?) the more we understood. The daily quizzes, guessing the codes for our lipstick, our favourite colours, even the colour of the New Year, all this helped us to get how we knew there was black in a colour, white, white and black. Together we were learning a colour language. Suddenly the notions of magenta based reds, reds with black, blues with green, all made sense to the ladies. A sign of the real Breakthrough happened last night. Madly trying to finish orders, Kopila and I come home each night and string beads. Last night, as we chatted ( human rights, Bollywood movies, colour theory) and strung, Kopila suddenly announced she knew why the red they got all those years ago that I said didn’t match our Pimento mala didn’t match! It was too close to yellow she excitedly said. We needed one closer to magenta! Didi, I got it. These words are music to my ears. It really is in the using of these cards that the confidence comes; that a language emerges. Every morning for two weeks now, we’ve started the day with a colour quiz. And we make mistakes, and we get it right, and we rifle through colour families, and we search all over our cubes. But this is the secret. Hands on learning. To those who have those cards, make those cubes, get the cards out of the boxes. Leap into colour! This entry was posted in Uncategorized on April 13, 2016 by wendy.